Feb 27, 2015: Cruising through the asteroid belt, NASA Dawn spacecraft is approaching dwarf planet Ceres, and some puzzling features are coming into focus. "We expected to be surprised by Ceres," says Chris Russell, principal investigator of the Dawn mission, based at UCLA. "We did not expect to be this puzzled." 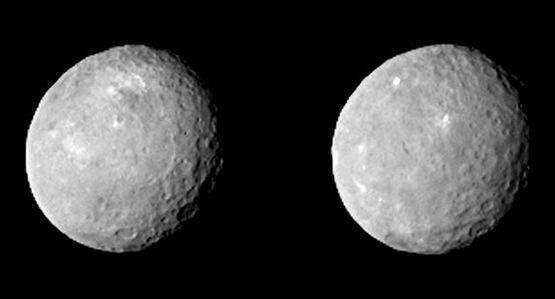 The camera on Dawn can now see Ceres more clearly than any previous image taken of the dwarf planet, revealing craters and mysterious bright spots. 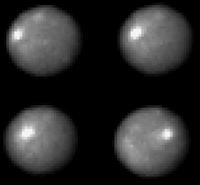 "We already knew from the Hubble Space Telescope that there were bright regions on Ceres," says Russell. "However, those images of the bright spots, taken more than 180 million miles away, appear to be large." At close-range, Dawn's camera is revealing something different. "As Dawn has come closer to Ceres, the bright spots have become brighter and smaller. Indeed, they are much brighter than the surrounding landscape and still unresolved in our images. The point of origin must be very small." "Another way to express this is with fractals," he adds. "Most of the planetary surfaces we see are cratered in a random pattern. When you get closer, just as with fractals, the surface looks the same regardless of scale." "However, the bright spot is telling us that there is a phenomenon that acts on a very small scale and NOT at the larger scale of the cratering." "And since I don't have a clue what this is I am puzzled." The view is about to improve even more. Dawn will be gently captured into orbit around Ceres on March 6, beginning a mission to map, explore and understand the dwarf planet. By the time Dawn is in its lowest altitude orbit at the end of this year, its pictures will be well over 800 times better than Hubble's. "Even though Ceres is in the asteroid belt, it is entirely unlike asteroids," says Dawn's mission director, chief engineer and lead blogger Marc Rayman. With an equatorial diameter of about 605 miles, Ceres has a surface area 38 percent of that of the continental United States, or four times the area of Texas, writes Rayman in his blog. Its size, nearly spherical shape and other factors have led astronomers to classify it as a dwarf planet. Moreover, it is the largest body between the sun and Pluto (another dwarf planet) that has never been visited by a spacecraft. "Earth is about to be introduced to a fascinating new world," says Rayman. Bright spots could be just the beginning of the surprises in store. Stay tuned to Science@NASA for updates.